Edmonia Lewis was the first sculptor of African American and Native American descent to achieve international recognition. Her father was black, and her mother was Chippewa (Ojibwa) Indian. Orphaned at an early age, Lewis grew up in her mothers tribe where her life revolved around fishing, swimming, and making and selling crafts. 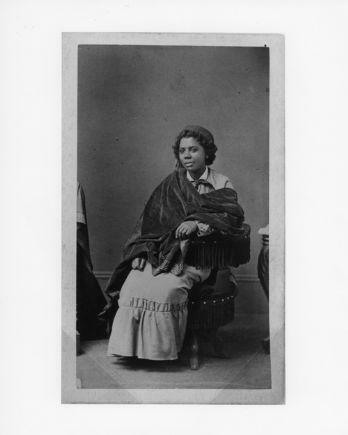 In 1859 she attended Oberlin College in Ohio, one of the first schools to accept female and black students. She developed an interest in the fine arts, but an accusation of poisoning, probably racially motivated, forced Lewis to leave the school before graduating. She traveled to Boston and established herself as a professional artist, studying with a local sculptor and creating portraits of famous antislavery heroes. Moving to Rome in 1865, she became involved with a group of American women sculptors and began to work in marble. Sculptors usually hired local workmen to carve their final pieces, but Lewis did all her own stonework out of fear that if she didn’t, her work would not be accepted as original. In addition to creating portrait heads, Lewis sculpted biblical scenes and figural works dealing with her Native American heritage and the oppression of black people.